I'm not really into pink. I barely have pink clothes or personal belongings in that shade. But surprisingly, I was in the mood for something pink on my nails a few days back. So I went to my stash and tried to figured out what nail polish I wanted as base. Sometimes, I come up with a nail design depending on the polish I choose. On other times, an idea comes to mind and the choice of polish comes after. Anyway, I decided to do a flower nail art design. Let me show you first how it turned out before I tell you what inspired me to hand paint this nail design. I simply called this -- flower power. My inspiration came from Sally Hansen's Girl Power Salon Effects. Girl Power is at the top of column two. I really liked that design. But I know mine is monochromatic and the flowers do not overlap. That's because I like defined lines. So I just took the idea of overloading my nails with a lot of baby pink flowers in different sizes. I loved it and the design sort of makes me look feminine even if I am in casual wear. For base color, I used Essie Foot Loose in 2 coats. I really wanted something dark on the background so that the flowers will pop up. The flowers were hand painted using acrylic paints. As of this writing, I am already thinking of creating a similar nail design with multi-colored flowers. I think that would really challenge my patience! This flower nail art design took me hours to complete. My left hand was beginning to shake when I was doing my right hand. I'll probably be recreating this nail art using other colors in a monochromatic theme as well. I really had fun doing this and people who actually saw it thought they were stickers! In a way, that was the effect that I was aiming for. I wanted something that would look like one of the designs from the Sally Hansen Salon Effects. Do you think it's too much? This is probably the first time that it didn't occur to me to have an accent nail. I got crazy and painted every nail as if they were accents. I really like this! The color is great and the flowers are so cute. 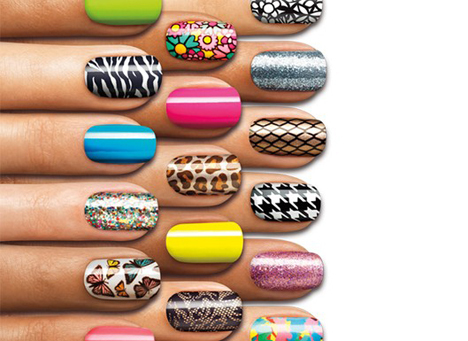 .......ahhhh, my daughter just saw your pic now she wants me to try this on her fingers, lol. you did a great job! they actually look 3-D. I thought this was water decals at first!!! and they are so beautiful!! love it! I really love it and love your movie.